Instead of whining about our awful projects today, I thought, for a change of pace, I would mention a purchase we've been very happy with. We strive—not always successfully—to keep the kitchen counters as clean and clear as possible. One dilemma we had to solve was how to deal with food scraps waiting to go out to the compost bin. 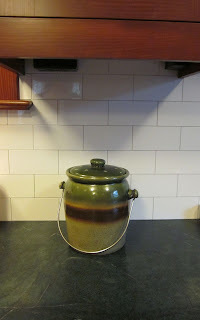 I found this nice crock at Gardener's Supply Company in spring and decided to give it a try. Shipping was fairly expensive, almost $10 on the $30 purchase, but we've been quite happy with the crock overall. And it looks a whole lot more attractive than the plastic tub we had on the counter last winter. Yes, much nicer than an open bowl of rotting food. And it has wholes in the lid so it breathes enough that it doesn't become an anaerobic soup too quickly. We had a plastic garbage pail with a lid, but it was rather cheap-looking. Unfortunately, we don't have a compost area right now, but we have a large green compost can that the city picks up every week. I need to make more use of it. I am planning on buying a compost bin that is counter worthy once we finish our remodel. We keep the ugly city-issued one under our sink and it is really a pain to get out from under there every time we cook or do dishes. yours is really nice.